Stay valid until 19/12/2018 and the 01/01/2019 (except Easter 04/18 - 22/04/2019). Extra bed - 30% discount of the price. Children under 3 years bey bed stay free Children 3-12 years on extra bed 50% discount, without therapeutic treatments, children 3 to 12 years on normal bed 30% discount on the total price residents without medical treatment. The price includes: - accommodation - full board - breakfast buffet, lunch and dinner choice of five kinds of meals (if half board are deducted from the price of € 3.00 / person / day) - Medical examination with consultation - 2 treatments per day - 1 day 1 hour. free entry to the Mining bath during limited hours - using massage-recondition machines - fitness - WiFi - parking check-in from 13 hours. The stay begins with dinner and ends with lunch. The day of departure rooms should be released until 10.30 am. Later arrival must be reported in advance at the front desk of the spa. Supplements: - local tax € 1 / person / night - for unoccupied bed 30% of the price - for unoccupied bed in the cell-room 30% of the price - for unoccupied second cell 30% prices stay - cot € 5 / night - late check out € 20 / person - Change of procedure requested by the client to place € 1 / Procedure - Changing the timing of the procedures requested by the client to place € 1 / procedure - Exchange of rooms at the client without objective reasons to place € 15 - only for meals buffet € 10 person / day Spa Sklene Teplice lies in the northwestern part of the Štiavnica Hills in Hot Creek Valley, in the district Žiar nad Hronom . Enchanting valley lies between Hliník nad Hronom and Podhorie 12 km from Banska Stiavnica - a unique jewel of world cultural heritage. From all sides are surrounded by rich coniferous and deciduous forests . The environment is suitable for relaxation and regeneration. Glass in the bath Telice are treated nervous system, diseases of the locomotor system and rheumatism. Currently Sklené Teplice springs several thermal springs with temperatures ranging from 37 ° C to 52.3 ° C. Thermal water has beneficial effects on physical and nervous system. All springs are related in their chemical composition and physical properties. In addition to thermal springs spring up here and Teplice with a lower content of minerals. Noteworthy is the unique cave steam bath "Parenica", which is unique in Europe . Thermal springs they emanate directly to the cave and its temperature of 42 ° C basking cave pool , which offers visitors the opportunity to take a bath directly in the cave in which wells up alkali- gypsum hot water. 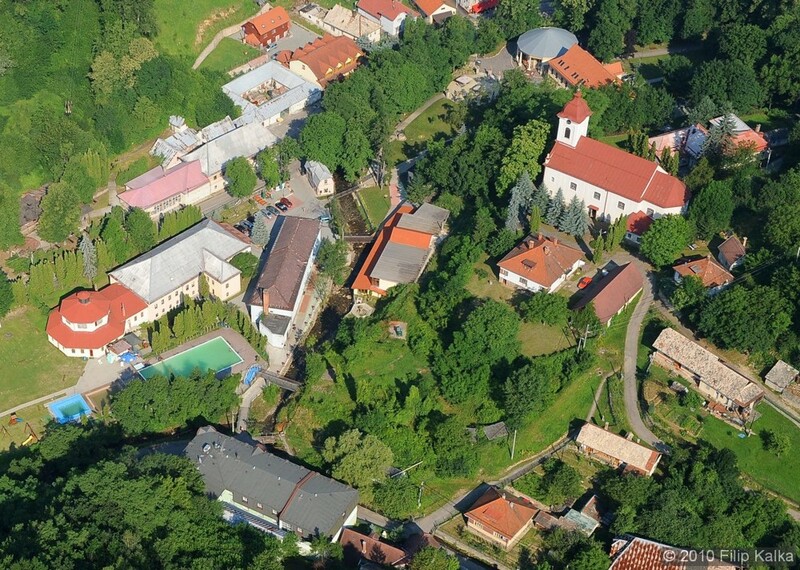 Slovak Spa Sklene Teplice now offer in addition to the unique thermal cave bath Parenica also therapeutic, relaxing, healing or wellness stays . - max. 20 min, followed by a wrap in a quiet room for a period of 20 min. and 20 min. relax in a massage chair. - KD Maria Theresa in the connection to the outdoor swimming pool (only during the cold months) - max. 30 minutes, then wrap and relaxation. - 8 x 7 m, entrance for 1 hour, suitable exercise in the water. The building of the Mining bath are provided following procedures: bath before midday group exercises for spa guests. The building will provide the following treatments: massage, peat bath, instrumental lymph drainage, massage chairs. From Bratislava - 175 km, 1 hour. 40 min. From Kosice - 244 km, 3 hours. min. from Žilina - 104 km, 1 hour. 30 min. V prípade záujmu o vstupnú lekársku konzultáciu je potrebný nástup do 15.00 hod. Meal: Strava je poskytovaná podľa budovy, v ktorej je klient ubytovaný nasledovne: Jedáleň v KD Alžbeta - pre klientov KD Alžbeta, Goethe, Matej Bela, Mária Terézia. Jedáleň Relax Thermal - pre klientov KD Relax Thermal. Ra 8:00 - 9:00, O 12:00 - 13:45, VE 17:00 - 18:45 hod. (podrobné informácie o čase podávania stravy pre jednotlivé KD dostanete na recepcii pri príchode). Parking: Parkovanie zabezpečené kamerovým systémom zadarmo. Check in / Check out: Check in: 11:30 (ak pobyt začína obedom), 14:00 (ak pobyt začína večerou). Check out: 10:00 (ak pobyt končí raňajkami), 13:00 (ak pobyt končí obedom). - for eating only the buffet € 10 person / day Spa Sklene Teplice lies in the northwestern part of the Štiavnica hills in Hot creek valley, in district Žiar nad Hronom . Enchanting valley lies between Hliník nad Hronom and Podhorie 12 km from Banska Stiavnica - a unique jewel of world cultural heritage. From all sides are surrounded by rich coniferous and deciduous forests . The environment is suitable for relaxation and regeneration. 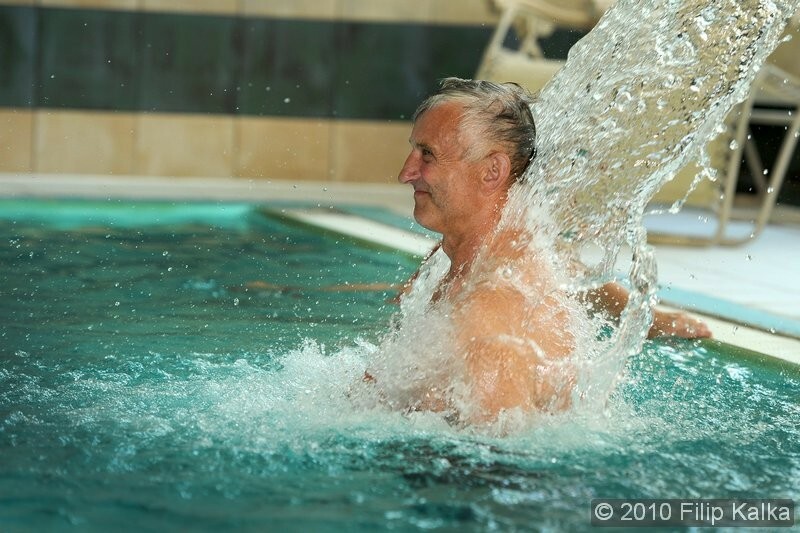 The Spa Sklené Telice are treated nervous system, diseases of the locomotor system and rheumatism. Currently in Sklené Teplice springs several thermal springs with temperatures ranging from 37 ° C to 52.3 ° C. Thermal water has beneficial effects on physical and nervous system. All sources are related in their chemical composition and physical properties. 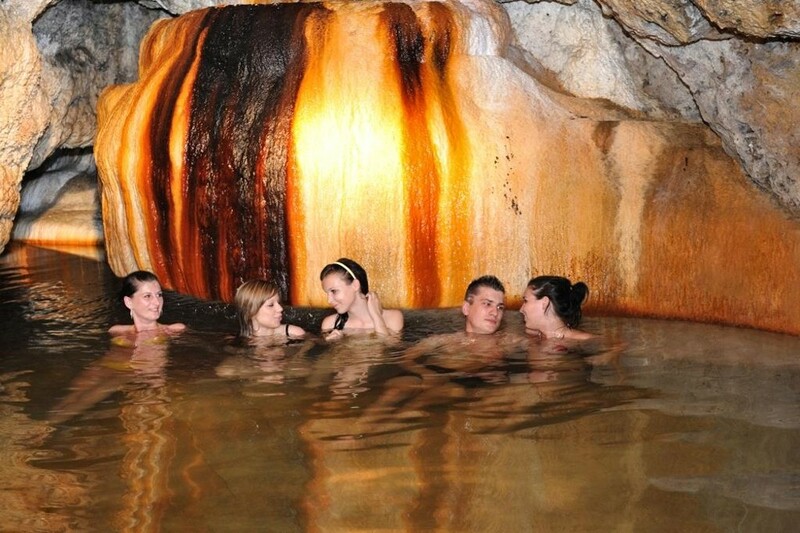 In addition to thermal springs that bubble up and Teplice with a lower content of minerals. Noteworthy is the unique cave steam bath "Parenica" which is unique in Europe . Thermal springs they emanate directly into the cave and its 42 ° C basking cave pool , which offers visitors the opportunity to swim directly in the cave in which alkali-wells up gypsum hot water. 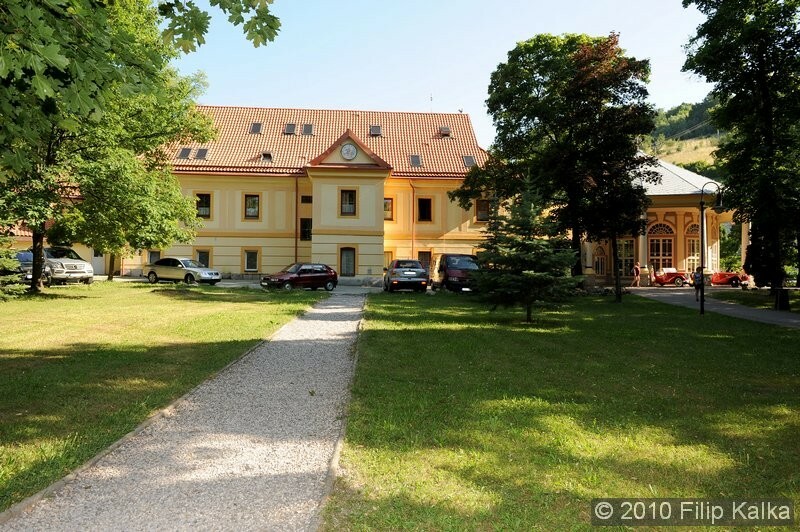 Slovak Spa Sklene Teplice now offer in addition to the unique thermal cave bath Parenica and healing, relaxation, health and wellness programs . - max. 20 min, followed by a wrap in a quiet room for a period of 20 minutes. and 20 min. relax in a massage chair. - KD Maria Theresa in the connection to the outdoor pool (only in cold months) - max. 30 minutes, then wrap and relax. - 8 x 7 m, entry for 1 hour, suitable exercise in the water. The building of the Mining bath will provide the following procedures: bath before midday group exercises for spa guests. The building will provide the following treatments: massages, peat baths, instrumental lymphatic drainage, massage chairs.